Finland, famous for Nokia, ski jumping, ice-hockey, javelin, and Metal bands. Now we can add blues-rock to that list, courtesy Erja Lyytinen. She only came to my attention this year after I read a positive write-up of her gig at London’s 100 Club back in April, but has actually been around for over a decade, with 10 studio albums and three live albums to her name. For this show, to the best of my knowledge her first in my local area, she and her band were booked into the L2 at Chester’s Live Rooms. The set-up was intimate, with low lighting, tables (complete with candles) and chairs set out on the normally standing floor area. If there was a support, I’d missed it (I took the train to Chester on this occasion) but got there to find a crowd of mostly guys my own age, all awaiting her arrival. It was a low-key entrance, as she and band strolled out through the main door, ambled across the audience and to the tiny stage in the corner of this room. Accompanied by a bassist, drummer and a keyboard player who had a real, genuine Hammond organ (yaaay!) 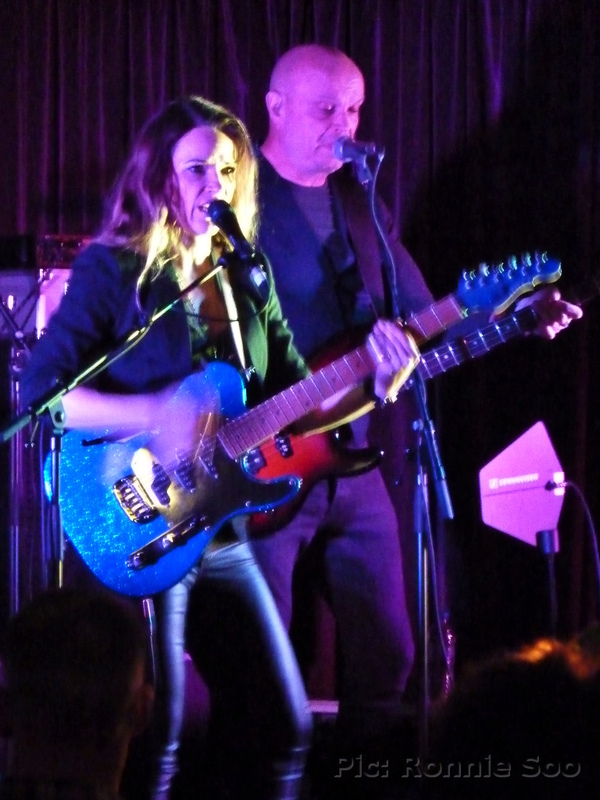 as opposed to a software patch emulating one, she introduced herself and band before strapping on a glittery blue guitar to kick things off with ‘City of Angels’, a track from her latest album ‘Stolen Heart’. Any inkling that this was going to be a quiet little gig was blown away within seconds, as that glittery guitar was set to kill with an almighty tone! I’ll admit to not having boned up on her music before this show, partly because I wanted to experience it ‘blind’ but I did have a reasonably good idea of what to expect, and she didn’t disappoint. Slide guitar, heavy riffing, solos both tastefully restrained and delightfully unrestrained, soulful singing and also giving her band space to show off as well (in particular Hammond player Harri Taittonen) with some soloing of their own. From my spot the sound of her guitar was a little loud, so that it did at times overwhelm her singing when she really unleashed the fury, but during the quieter moments she did show what a fine singer she is too. She got a tremendous reception from the audience, as said before it was about 100 at the most who showed but it sounded like far more. She said that she and her band will return to the UK in March next year, I’d expect word of her to spread rapidly after this run and so if she returns to Chester it should be the main room next time, where greats of this style such as King King and Joanne Shaw Taylor have already graced that stage. The biggest rock band in the world return with their ninth album. Unsure as to that claim? Look at the profile of mainman Dave Grohl; he’s everywhere, not just in the rock press, but in all the gossip columns. He has all the high-falutin’ friends (no less than Paul McCartney appears on this album, for instance) and it wasn’t that long ago that the Foo Fighters played alongside Jimmy Page and John Paul Jones – at a huge stadium gig that has been their domain for several years now. This is one rock band that your friends, work colleagues, family has heard of – if you’re a dedicated gig-goer you’ll know all too well how often people dismiss the band you have a ticket for with those words: ‘never heard of ’em’, as though that renders the band non-existent. No problem here, even your ordinary average Heart FM listener knows who the Foo Fighters are, and when they do play their huge stadium gigs, they attract the sort of crowd who wouldn’t normally have anything at all to do with ‘rock’. In short, they’re the one rock group it’s ‘OK’ to like. So, this is surely the sort of release that is an ‘event’, one which will see folk flocking back in their droves to the much-maligned record stores to grab their copies, yes? Well, possibly. They are of such stature now that they’re ‘critic-proof’; no matter what is said or written about this record, it will indeed likely fly out of the stores (or down the superhighway, if it is downloaded). At the time of this post, it is the number one album in the UK charts, and looks set to stick around for a while. But is it any good? Thanks to the (also much-maligned) Spotify, I decided to give it a listen or two and find out for myself. I’ve not stayed in close touch with the Foos since they attained megastar status (the last time I actually saw them live was in 2002); I’ve liked a few tracks from their more recent output but to these ears, they’ve never really bettered ‘The Colour And The Shape’, now a staggering twenty years old. For this record, the band recruited some major names, starting with producer Greg Kurstin (who has worked with Adele, and written for many other big names in the pop world), and the aforementioned Paul McCartney contributes drums on one song (‘Sunday Rain’). That in itself raised eyebrows, since this band contains two accomplished drummers already. Other guests include pop stars Justin Timberlake and (Boys II Men singer) Shawn Stockman, although you won’t find much influence from that sphere in this record. It’s still recognisably Foo Fighters, with plenty of guitar wallop, and both Grohl’s familiar roar and more melodic singing voice are present and correct. What there isn’t, is a song that sticks in the mind the way previous numbers such as ‘Times Like These’, ‘Everlong’, or ‘Learn To Fly’ did. I could go through the previous albums and come across at least one title on each, and have the tune instantly pop into my head. Grohl & Co. always had a knack of writing a pop song with enough rock punch to appeal to those of us who prefer a fist in the air to a waving lighter. That isn’t the case here, none of these songs have that hook. Even after a few playthroughs, not even lead-off single ‘Run’ lingers in the mind for long. It does have its moments; the McCartney-driven ‘Sunday Rain’ is a fine late-era Beatles pastiche, with Taylor Hawkins coming out from his drumkit to take lead vocal to good effect. The slower ‘Happy Ever After (Zero Hour)’ also provides a change of style from the rest of the album, reminiscent of ‘Blackbird’ (by The Beatles, not Alter Bridge!) It all sounds big; ‘The Line’ creeps close to Killers territory for instance. It all sounds mighty and impressive, but half an hour later you won’t find yourself humming much of this. The title track closes things; it is meant to be a brooding epic, but merely plods along to its concluding powerchord. (There is an extra ‘bit’ after the track concludes, but not much to get excited about). It isn’t a BAD album, but it isn’t a great one either. When we are talking about the biggest rock band in the world, it isn’t enough to listen and think, mmm, that wasn’t bad. The Foo Fighters are now heading up the very same rock establishment that Grohl’s previous band was credited with dismantling, and sadly this record does come across as a bit too ‘establishment’. Not one I’ll be rushing out to grab on any physical format, for my Foos fix it’s still the first three or four albums that I’ll be reaching for. Those DORJA girls are adept at generating a buzz alright, with the release of their latest single ‘Far Gone’ after a lengthy teaser campaign involving cover art, snippets of the track and a brief taster of the accompanying video all leaked to social media over the past few weeks. 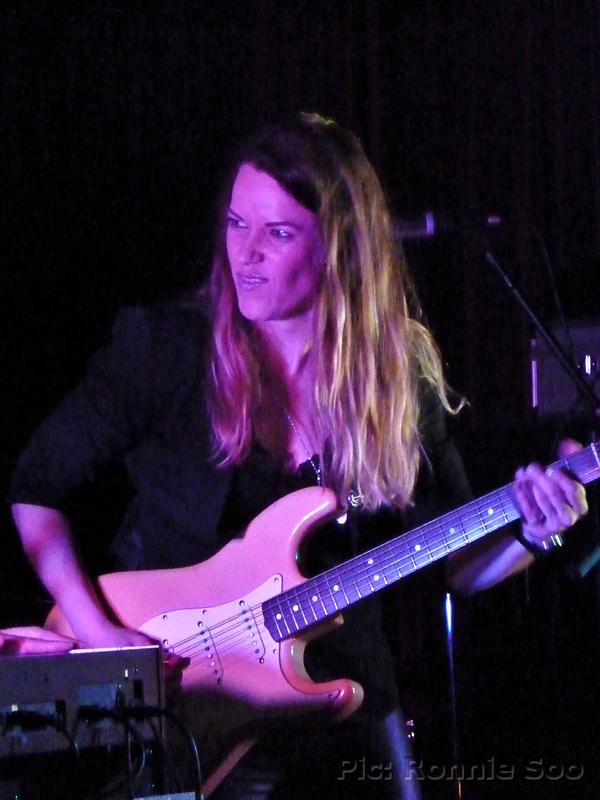 The track itself is the first to feature new guitarist Sarah Michelle, who joined in the summer shortly before the group played a series of UK dates. One of those gigs was a return to PKD Festival, held in Scotland and where DORJA made such an impression upon that event’s organisers in 2016, that they booked the band again immediately for the following year. Footage from their 2017 appearance has been used for their promo video, which is linked at the bottom of this post. ‘Far Gone’ has been part of their live repertoire for some time; I saw them play it back in March, yet was only recorded in the summer while all the members were in the UK. The song is a blues-influenced hard rocker in their now-familiar style, gently led in by Sarah Michelle’s opening guitar and Aiym Almas’s throaty vocal, before the powerchords kick in, in true Whitesnake tradition (‘Break me, or take me as I am, I’m not giving in’). The arrangement is similar to the live rendition save for the absence of the brief drum solo – but they have simply replaced one Zeppelin nod with another, with ‘Whole Lotta Love’-styled atmospherics in its place (kept short). If you liked the material on the earlier ‘Target Practice’ EP then you should enjoy this too. It wouldn’t surprise me if it were to appear in physical form on a future EP as they have more material ready to go, and have been writing again since Sarah Michelle joined up. She is a perfect fit for this band, and I look forward to hearing how she influences the writing of their future material. For now though, this will keep we Dorjians going until they reconvene for more live dates, which are planned for early 2018. With the membership scattered far and wide, they have to plan things long in advance, but they’re gaining a loyal following which should mean we see and hear a lot more from them in the coming year. The video for the single is now available on youtube, to get a high-quality download of this track please click this link to go to their online store. When DORJA founding member, guitarist Holly Henderson announced her departure from the all-girl rock quintet earlier this year, one of the reasons she gave was that she was ‘still searching for her musical identity’. There always was more to her than meets the eye (or the ear); even while playing rhythm guitar in a touring covers band she had been writing her own music and putting up demos. The material she wrote herself was often very different from what she was doing in a band situation; she’d co-written three songs in a punky style for a previous band before contributing to the writing of all the material issued to date from DORJA (including that band’s imminent release ‘Far Gone’). Her own stuff however was drastically different; ranging from laidback, late-night listening to more rocking, but alternatively-styled music she has proven to be an artist willing to switch styles and genres, keeping her followers on their toes. ‘Desert Wax’ is a concept EP, the storyline of which she has gone into in more detail about on her own site but is essentially about a group of people so disillusioned with society that they break away in search of their own space. The title track sets the tone, with layered, echoed vocals over an ambient backing track. Her vocal is drenched in effects, so that it becomes another colour on the palette. ‘Not’, the third track does appear to feature a guitar but don’t expect hard rock here – the idea is for this music to take you on a journey, and I found it best listened to as a whole, in one sitting, with headphones to get its full impact. If you’ve got an upmarket hi-fi and have the isolation in which to listen to this properly, you’re more likely to feel this music more deeply. Standout track for me is ‘Safe Place’ in which Holly duets with herself using two different effects, (one deepened) on her voice to achieve a call-and-response type of song (“Take me to a safe place/I’ll take you to a safe place“). 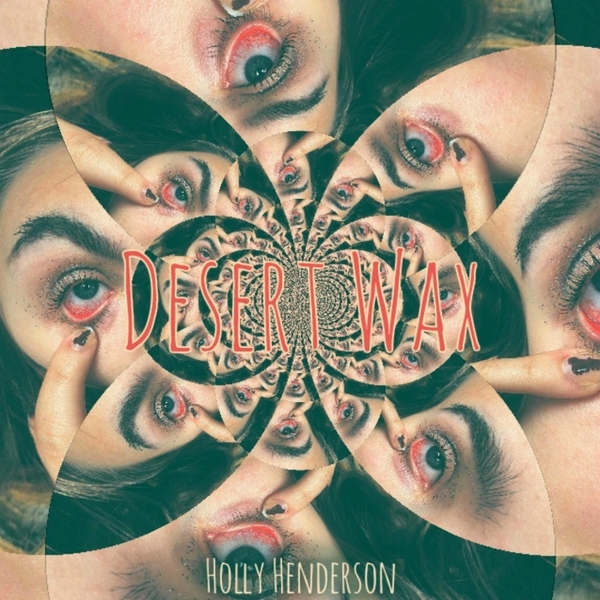 Holly could probably come up with something distinctive even if you just gave her a paper and comb, but ‘Desert Wax’ shows her in a totally different light to what I’ve seen and heard of her before. If I’m completely honest I don’t think I’d let many other artists take me on the journey I found myself embarking on with this EP, it is so far outside my metallic comfort zone. Once over that mental hurdle however, I found this to be an engaging listen, with more than a hint of prog. She has that knack of drawing you in, just as she did with previous offering ‘Opium Drip’. She has however demonstrated a depth and range to her talent that will take her so much further, and with the release of her first full album of original material still to come, I see only a bright future for this Maidstone miss. Things are certainly different for CATS in SPACE now than they were two years ago, when they announced themselves with their debut album ‘Too Many Gods’. That record got them a lot of attention, most notably from Thunder’s Danny Bowes. In addition to wearing their T-shirt at Thunder gigs, he played tracks from ‘Too Many Gods’ on his Planet Rock radio show and earlier this year, signed them up to be the support act on Thunder’s UK tour. That slot put them before a lot more people, and their fan base has grown exponentially since then. The guys are of course no newcomers; all accomplished, experienced players who have been in and around the scene for many years. In that respect they’re similar to The Dead Daisies, though that outfit have been through a few personnel shifts before settling on their current line-up. The CATS’ debut showed obvious musical influences from many 1970s bands (even including a contribution from The Sweet’s Andy Scott) but with lyrical content dealing with more 21st century subject matter. That set them apart from just about everyone else, so what can we expect with this second record? Simply put, more of the same with knobs on! Like the first album, it’s best listened to right through in one sitting, although the individual tracks are strong enough to stand up to being listened to in isolation. Lead-off single ‘The Mad Hatter’s Tea Party’ deals with the shallow facade of social media (“Conversation’s a no-no, it’s dead as a dodo”) while ‘Two Fifty Nine’ is a cleverly-constructed song about the need to fit into radio formatting – running to exactly 2:59! Closing track ‘Scarecrow’ is stated in the lyric sheet as a continuation of the first album’s ‘The Greatest Story Never Told’; the lyric in this song refers to “Cool Britannia’s Great Untouchable” (who could they be referring to, teehee!) Running to 7:26 it is an epic (which reminds me a little of Uriah Heep) with which to end the album. If you liked ‘Too Many Gods’ you can buy this record with confidence, it is another meticulously-constructed and beautifully-produced album with all the hallmarks present and correct. The band will tour the UK in September, I expect there to be a lot more people present this time around than was the case when they played the halls up and down the country last autumn. The CATS rocket is now in its second stage as it makes its relentless progress into orbit!